Remember the iconic scene from the 1979 film "Alien" where a creature busted out of Kane's (John Hurt) chest while eating dinner? 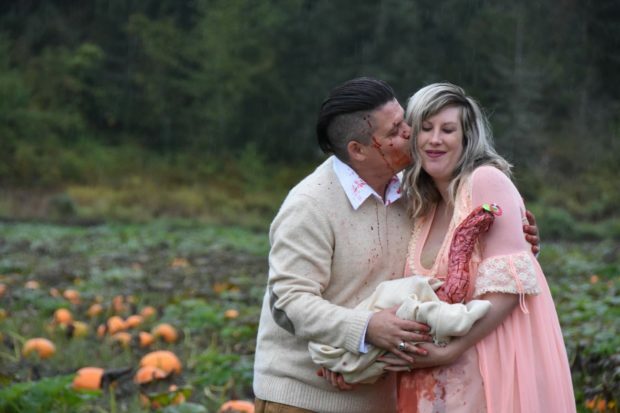 One couple in British Columbia thought it was a great idea to recreate it for their maternity shoot. It appears Todd and Nicole Cameron opted to do something quirky for their maternity shoot since it was the Halloween season. 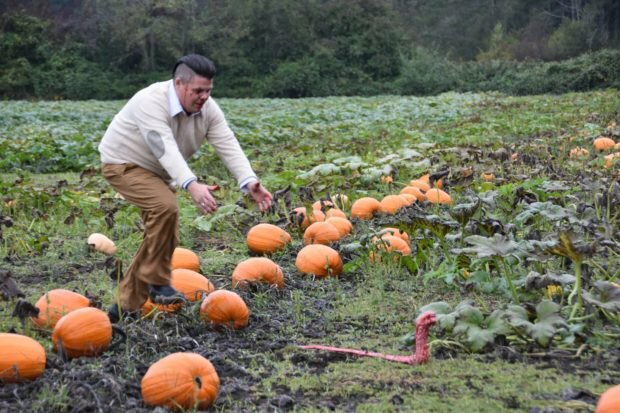 He and Nicole had the shoot at their local pumpkin patch, and assigned a professional photographer Li Carter to do the shots. Todd was proud of the shoot and shared it on his Facebook page Tuesday, Oct. 9. The post has since gone viral, with 91,000 likes and reactions and over 203,000 shares, as of this writing. In the photos, Todd and Nicole pose just like in any other maternity shoot. The fun starts when in one shot, Nicole appears to be screaming in pain, as if she is about to give birth to her child. Suddenly, the alien "chestbuster" comes out of her belly and Todd's face is splattered with blood. He even chased the creature on the pumpkin patch. Once caught, it was wrapped in a blanket and the couple embraced it as their child. Todd told the magazine Bored Panda that it was a chestbuster model at a garage sale which inspired him to do the shoot. "I had an idea for the general story and props needed, including carving the alien pod pumpkin and Nicole took care of finding our 'out there' wardrobe," he said. Another inspiration for the shoot was Todd and Nicole's love for Halloween. "We actually first met at Halloween, we always hand-make elaborate costumes and we go all out on Halloween decorations at our house," he was quoted in the report. "So this was really just a fun way to celebrate who we are while passing on a few smiles and laughs in the process!" And although the atmosphere was "chilly and muddy" during the photoshoot, Todd and his team did not let this stop their fun. "We just kept laughing at the absurdity of it and hoping the employees of the farm wouldn't drive by to see us covered in blood," he said.